(Former National List MP and Prominent Academic – Author Rajiva Wijesinha has a reputation for speaking out forthrightly on issues affecting the nation at large. In this exclusive interview with the “Daily Mirror” Prof.Wijesinha responds to questions on a number of matters including the track record in governance of the present Govt, ethnic reconciliation, internal politics of the SLFP, Maithri- Mahinda relations, Leader of the Opposition,resentment in the armed forces and the future role of ex – Defence Secretary Gotabhaya Rajapaksa). QYou were one of the few MP’s who crossed over with Mr. Maithripala Sirisena in November 2014. You supported him at the January 2015 Presidential poll. He was elected president and you were made a state minister. Subsequently you resigned from that Govt but remained supportive of President Sirisena. However after the August 2015 Parliament elections you were not appointed a national list MP. Why do you think that happened and where does it leave you now? I suspect I fell victim to the internal warfare between supporters of President Sirisena and President Rajapaksa. I took seriously the President’s decision to give his predecessor nomination, since that was the best way of promoting a SLFP / UPFA victory, and ensuring indeed that the party was not decimated. But those around the President panicked him with stories of what a Rajapaksa led SLFP victory would mean for him, while in turn this was fueled by the latter’s supporters claiming that they would be revenged on the President if they won. Neither side took note of the reality that the party was not likely to win an absolute majority, and that even if it did, there were enough solid supporters of the President to ensure that the Prime Minister would be someone he chose (though it would of course have had to be with his predecessor’s support). As a result the President played games with the Secretaries of the parties, and sadly the UPFA allowed this to happen. The claim was that he had to be absolutely sure of the allegiance of any National List nominees, and those who were currying favour – none of whom had dared to speak out when the Sirisena campaign was launched – doubtless told him I could not be relied on, even though I had been told that he had wanted me on the National List, and he should have known better. But in any case the UNP had been allowed a significant plurality, which is why this is not really a genuine coalition, but one dominated by the UNP. Perhaps that is just as well, since it is more likely that President Sirisena, if he really believes in the manifesto on which he won the election, will realise that cannot be fulfilled by a UNP government as constituted at present. QWhen you became State minister of Higher Education in President Sirisena’s Govt much was expected of you as you had wide knowledge and experience in that sphere. Yet due to differences with the cabinet minister and also the Prime Minister you resigned within 5 weeks. What led to your resignation? Has the passage of time made you regret the decision? The Cabinet Minister reneged on his commitments to me, and made the UGC Chairman resign, citing reasons which the Prime Minister later denied. It was clear that they both saw Ministerial office as a way of satisfying their supporters with plums – which indeed even a decent politician like Ajith Perera had demanded, shamelessly, at a group meeting when I had thought the government was about principled reform. The President assured me that he would not allow me to resign, but when the Prime Minister lied about the matter in the House, I thought I had to make the position clear – not least because the Central Bank bond scam had come to light, and it seemed clear that the government had welshed on its commitments regarding probity and good governance. Since it has continued on this path, I think I am well out of it. I am sorry for the sector because I did a lot in the short time I was in office, but I suspect I would not really have been permitted to function effectively, given what the Prime Minister was up to. QWhat is your present political relationship or stance towards President Maithripala Sirisena and Ex-president Mahinda Rajapaksa? Can you be categorised as belonging to both camps or to one of them or as independent of both? I would say both camps, because I continue to believe that it would be better for the country for them to be working together, since despite personal differences they have more in common in terms of political philosophy, namely a commitment to social justice and equity, than the Jayawardene / Wickremesinghe UNP has. But I don’t think either would see me as being in their camps because both know that my allegiance is not to an individual but to the country. I suspect though that Mahinda Rajapaksa, to whom I was maligned before the election because I was critical on particular issues, now realises who his true friends are, given the antics of some of those who were sycophantic to him when he was in power, and indeed led him astray on vital issues. Similarly, President Sirisena is no fool and doubtless has the measure of some of those who jumped to his side after he won. QYou and Dr.Chanaka Amaratunga were responsible for establishing the Liberal Party in Sri Lanka in the eighties of the last century. After Chanaka’s tragic demise you provided leadership to the Liberal party in Sri Lanka. What is your current status within or with regard to the Liberal party? I resigned from the party when the strategy I had followed, which the party had adopted, failed. Following a committee decision, we had written to the UPFA asking for an alliance, and its General Secretary responded, but there was a delay in sending the reply since our Secretary also wanted to sign and he did not come to Colombo for some time. Then, on the pretext that we had not got a signed copy of the agreement, he claimed that there was no agreement, even though in fact a committee decision mandated further negotiations. Development activities have stopped, and the structural changes that were pledged have been ignored. The commitment to change the electoral system was ignored, and so the bribery of MPs with more and more privileges and more and more ministries continues. The real reason was the double dealing of our Asst Secretary, as the Secretary noted later .But when the coalition politics we had followed failed, I thought it best to acknowledge this and step aside and let the rest, who seemed in a majority, pursue the path they wanted, involving even an alliance with the UNP. This would have been anathema to Chanaka, who had been deeply critical of Ranil Wickremesinghe (though he was much more positive about President Premadasa, and Gamini Dissanayake), but I felt I should remove myself. But now I gather there is intense infighting, with the Secretary banning the Leader from attending a meeting he has called for just a few of his loyalists . QMuch was expected of the so called “Yahapalanaya” Govt when it was first formed in Jan 2015. The Govt continued after the Aug 2015 elections also.How would you assess the track record of the Sirisena –Wickremesinghe Govt so far? Appalling, in that corruption continues, more insidiously than under the last government if less obviously. Development activities have stopped, and the structural changes that were pledged have been ignored. The commitment to change the electoral system was ignored, and so the bribery of MPs with more and more privileges and more and more ministries continues. It is clear that, if an election were held tomorrow, the government would lose. I cannot find anyone, except what I would term die-hard UNP supporters and some sections of the Colombo elite, who still support the government, and I think President Sirisena should understand how sad are those who voted against the incumbent because they thought the common candidate would uphold traditional SLFP policies. I think he knows what the problem is, but he feels beleaguered, and those who now benefit from his patronage will not let him think clearly. A litmus test will be whether he allows Arjuna Mahendran to be reappointed Governor of the Central Bank. If he does so, I think the Joint Opposition will even win the support of idealistic elements in Civil Society, provided it makes clear it will not go back to the excesses of the last government. QA very confusing scenario prevails in respect of the Sri Lanka Freedom Party (SLFP) in particular and the United Peoples Freedom Alliance(UPFA) in general? At one level a facade of unity is being maintained. Stalwarts continue repeating that the party is united but in practice there are two broad camps. One is with the Govt and the other is in the opposition.MP’s from the opposition are enticed into Govt ranks with portfolios. Yet many of those in the Govt camp remain loyal to Mahinda despite professing allegiance to Maithripala. What is your view on this? Can this ambiguous state of affairs go on?What lies ahead? The current state of affairs is a disaster for both sides, and I feel it can be easily resolved, but that would need a spirit of compromise on either side. Sadly there are elements on both sides that profit by the split, and will work against compromise. I believe however that Mahinda Rajapaksa, though obviously emotionally affected by what seems unfair persecution, understands that the President is the elected leader of the country and should have primacy in any agreement to work together. But the President should realize that his predecessor had an energy and a vision that the country sorely needs. And he should also understand that politics may be about numbers, but statesmanship is about quality not quantity. There was an excellent interview recently given by one of the brightest young SLFP MPs, Shehan Semasinghe. I had noticed how sensible he was earlier, along with other educated youngsters of the next generation, such as Ramesh Pathirana, Kanaka Herath, and Vidura Wickramanayake (who is not so young, but has strong principles, and was indeed one of the few to sign one of the letters Vasantha Senanayake and I drafted to tell the former President that reforms were needed). Shehan notes that it is those such as Mervyn Silva and Sajin Vas Gunawardena, who helped destroy the reputation of the Mahinda Rajapaksa regime, who are now with the government, the former running behind Ranil, the latter trying to play Mr Fix-It for this President. Surely President Sirisena should think about the company he has to keep, and try to build up his party with good leaders of the next generation who would take it forward? QEvents like May day rallies are organized separately by each faction. The “official” SLFP threatens dissidents with punitive action if they attend events organized by the Mahinda loyalists. Yet a very large number of MP’s , Provincial councillors and local authority members defy the diktat. No action is taken. Why is this? Is it because President Sirisena is party leader in de jure terms only whereas Mahinda Rajapaksa is in actuality the de facto leader? There is obviously greater respect from President Rajapaksa amongst the SLFP rank and file, because they see him as the champion of their party, whereas President Sirisena is seen as having promoted a UNP government. This is a bit unfair on him, because he does I think want to uphold his own values, but after what he did just before the last election, there is a sense that he cannot be trusted. And while during the minority government days he could have done better, I think he was deeply disappointed that none of the senior members had supported him before the election, so he left them out when he brought some party members into the government in March 2015, but did not have anyone with a distinctive SLFP identity. So you can understand the hankering after his predecessor and though doubtless, since he is President, he may attract more followers, he cannot be sure of their allegiance. Q In an article written by you last month you describe Minister John Seneviratne “ as the most senior and the more sensible member of the SLFP”. Now Mr. Seneviratne suggested some days ago that former Defence Secretary Gotabhaya Rajapaksa should be inducted into the SLFP as the “second leader”. Why do you think he said that? And do you think it is a feasible proposal? His suggestion completely justifies my claim on his behalf, for it seems to me the best way forward for the SLFP. As you know, while I was deeply critical well before the election of those who basically ran the Rajapaksa government – and I can take credit for being the only person in the government ranks to have said all this openly – I felt that there were two figures who were not self seeking, namely Lalith Weeratunga and Gotabhaya Rajapaksa. And though I was critical of his flirtation with the BBS and of what happened at Weliveriya, apart from that I thought he had a good track record, of efficient service to the country. And even over Weliveriya, when I signed a petition requesting an inquiry into that appalling incident, he called me up and shouted at me, which I thought was a sign of openness, unlike those who were attacking me behind my back. No one – except perhaps Sarath Fonseka – doubts that he was an excellent Secretary of Defence and an even more excellent Secretary of Urban Development. The hash now being made of those functions makes it obvious that the government would benefit from his expertise, and unlike others there is no trace of dishonesty or impropriety. The current state of affairs is a disaster for both sides, and I feel it can be easily resolved, but that would need a spirit of compromise on either side. Sadly there are elements on both sides that profit by the split, and will work against compromise. I still recall, after the horrors of money making over arms, through relations of the Secretaries to Presidents Jayawardena and Kumaratunga, and when Tilak Marapana was Minister of Defence (even though Malik Samarawickrema assured me that he was not the money maker, but they knew who was really responsible), the relief of the Armed Forces when Gotabhaya made it clear that it was enhancing their capacity that was his priority, not commissions. He would be an excellent choice to provide leadership to the SLFP, and would help, while being loyal to the President, to bring the two sides together. QCertain straws in the wind seem to indicate that despite outward appearances there is a political cold war on between the UNP and sections of the SLFP within the Govt. There is a general impression that these are like two bulls yoked to the same cart pulling in different directions. What is your opinion? Frankly I don’t think there is any sense of direction at all. Only a few Ministers are able to conceptualise and plan, and the Prime Minister, who is grabbing more and more subjects under his purview, and doing less and less about what he grabs, does not seem to care about appointing jokers to important positions. Where Education is concerned for instance he seems to be emulating Caligula who made his horse a Consul, and even though there is a relatively good Secretary there, he should be given policies to implement or else allowed a free hand to make policy with able advisers. Finance is another mess, with changes all the time, and Industrial Development seems at a standstill. QHow would you assess the economic performance of the Govt? Disastrous, with money being wasted on perks and privileges, with no clear strategy to promote investment. After the denigration of China, the Prime Minister seems finally to have realized that he needs that country, but is still riding on what the last government proposed with no focus as to the development of particular areas needed. His Ministers for Regional Development are incapable of conceptualization, except for Champika Ranawaka, who has been saddled with the megapolis concept, a stupid title for a Ministry since the focus should be on outcomes, not structures – I am reminded of what I kept telling the last government, that construction was all very well but more was needed with regard to development of human resources. Former Deputy Central Bank Governor Wijewardene has an illuminating weekly column on the state of the economy. He used to be critical of what went on under the last government, but the incompetence and prevarication of this lot is beyond belief. I cannot believe that Arjuna Mahendran could have got away with the first bond scam, and now the second. I am shocked that the President was dragooned into dissolving Parliament before the COPE report came out, and shocked too that the JVP has not taken the matter up even though they now chair COPE. It is appalling that Civil Society is not making more of this matter, and disgraceful that the impact on interest rates – and the increased cost of government borrowing, which has of course to be passed on to the people – has not been criticized more coherently. QYou have played a prominent role in promoting ethnic reconciliation and inter –racial justice and equality in the past. What is the situation in that sphere now? Have we progressed or regressed? Sadly Mahinda Rajapaksa was not really interested in reconciliation, or rather he swallowed the Basil Rajapaksa line that that would come with infrastructural development, so he took no special measures. He completely ignored the draft Reconciliation Policy I prepared, which was deeply disappointing. But now the present government has also ignored that, and is busy reinventing the wheel, and taking over one and a half years to move. I suppose this is typical of President Kumaratunga, but what is even sadder is that she thinks being in charge of Reconciliation is a position through which she can indulge in her bitterness towards her successor. I recall that, when I sent her my draft, she told me that it had some good ideas and she would incorporate them in her policy (which, 16 months later has still to see the light of day) but then the rest of her letter was an attack on her successor, saying she was surprised that I had thought he was interested in Reconciliation. One of her staff told me recently that they had at last convinced her that she should not attack him every time she opened her mouth, but I fear old habits die hard. Interestingly UNICEF, which has got a Consultant down for Reconciliation, doubtless at vast expense, wanted me to meet the Consultant, but I said I was tired of beating my head on a brick wall, and suggested they read my draft policy instead – they had not seen it upto then. When they still wanted a meeting, I told them to write to me, but obviously they are nervous to do so, though I said I would grant one. Then, a few weeks later, I was rung up by someone from the Reconciliation Office to say that UNICEF had called several times to ask that a meeting be arranged. I made the same answer, that they should request one in writing, but obviously they are not concerned enough to commit themselves in writing – I suspect they fear that President Kumaratunga will have apoplexy if she hears that they have asked for advice from President Rajapaksa’s Adviser on Reconciliation. Way back in 2001 the then Australian High Commissioner told me he had never seen a country regress as Sri Lanka had done in the three years he had been here. I fear that regression is the norm as far as President Kumaratunga is concerned, and Reconciliation will suffer the same fate as the country did under her – and whereas at least there was some consistency in the Rajapaksa view of what needed to be done (even though I believed that was wholly inadequate), it is tragic that a woman of good intentions should be so incompetent in fulfilling them, and so prone to allowing her private predilections to disrupt things. QYour father was a respected secretary –general of Parliament. From the little that I know of him I feel that were he alive and been consulted about TNA leader R. Sampanthan being Leader of the Opposition under present circumstances , Mr. Sam Wijesinha would not have approved of it. This is because of the dichotomy between legality and legitimacy. Am I correct or not in this surmise? Could you elaborate please? You are quite right in that he had in 1977 advised the then Speaker that the Leadership of the Opposition should go to the possible alternative government. But the then Speaker ignored him and appointed Mr Amirthalingam instead of Mrs Bandaranaike, which was a grave mistake since, given the TULF manifesto, even if Mr Amirthalingam was not a diehard separatist, the impression created internationally was that Sri Lanka was a country divided on racial grounds. This time the situation is even worse since in terms of numbers there is a large group in the opposition which has no status, whereas the status is given to one party a quarter the size of the biggest opposition group, and the position of Chief Government Whip given to one which is an eighth of the size. Karu Jayasuriya has behaved appallingly in not following international practice (at least in 1977 the TULF led on numbers), but rather acting in the interests of his party. I am shocked because until he became Speaker I had thought of him as a man of principle. Earlier, when he did nothing, he would indicate that he was not trusted and his hands were tied by his Leader, but he seems now, even though he occupies a position of trust for the Nation, to do what he is told. That has been for me the most depressing revelation of the last year, since with others in government one knew that bad faith was to be expected. QRecent developments seem to suggest that there is growing sub-subterranean resentment within significant sections of the armed forces about the envisaged investigation into alleged war crimes in terms of the UNHRC resolution. There is a possibility that the Govt may have a crisis on its hands domestically if it tries to implement the UN resolution it co-sponsored. What is your take on this? The government has let down our armed forces badly, but this is understandable since those in authority now are those who were letting them down when they were fighting the terrorists. Mangala Samaraweera’s pronouncements on atrocities committed, made because he was trying to score points against the political leadership (and now he seems to be trying to excuse men on the grounds that their officers gave the orders) were outrageous and prompted a foreign observer to say he should resign – or be dismissed – if he thus lets down his country. His antics in Geneva were bad enough when, had he had any sort of a backbone, he could with Third World support including that of the Indians, have got a less damaging resolution through. Then he kept interpreting that resolution in the worst possible way, and has let the President down badly, in his anxiety to curry favour with the West. But he should also realize that, not only does the West want its pound of flesh, it will also want blood since its priorities are its own constituents (especially in an election year in America). The West is simply not reliable, and we should not blame them for this but realize this is inevitable given its sound bite (and financial contribution) based approach to democracy. Yes, the armed forces are obviously seriously upset, though as they have shown (except briefly during the UNP prompted attempted coup of 1962) they are a disciplined and democratic lot. 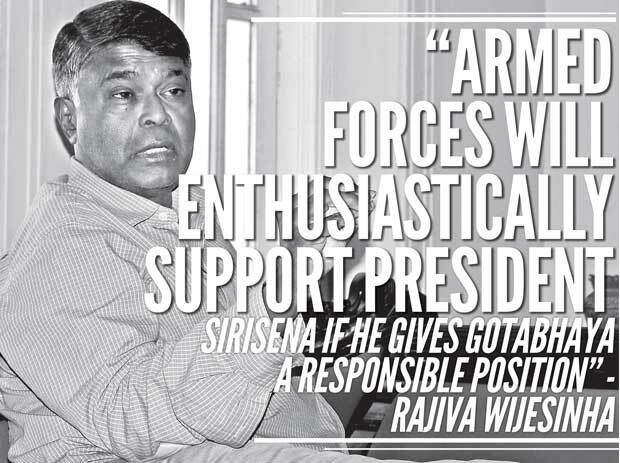 But they will certainly support President Sirisena if he stands firm on the lines he has sketched out. And they will do so enthusiastically if he follows John Seneviratne’s advice and gives Gotabhaya Rajapaksa a position of both responsibility and influence. QWhat do you think of current efforts to draft a new Constitution through a Constitutional Assembly as opposed to the Constituent Assembly that enacted the 1972 Republican Constitution? This seems to me to be yet another effort by Ranil to give himself powers beyond those of the President without having to face an election. I stopped that being put in the manifesto (though the President’s response when I consulted him indicated that he was not in favour), We stopped it again at the March 2015 meeting when Jayampathy Wickremaratne produced a draft to make the President act always on the Prime Minister’s advice – which led Ranil to say plaintively that he would complain to Chandrika. That perhaps led to the Ministers she had chosen playing ball in Cabinet so the clause was reintroduced, but then the Supreme Court turned it down. It remains to be seen now whether Ranil will be able to smuggle this clause in or whether those loyal to the President and / or the SLFP prevent it. QIs the 19th Constitutional Amendment paying dividends? Would you say for instance the Constitutional Council is working satisfactorily when viewed against the backdrop of the recent appointments of the Attorney – General and Inspector – General of Police? The Constitutional Council was perverted when it was not specified that members of the Executive should not serve on it, since there is now a clear government oriented majority, whereas what was envisaged was those able to reflect independently. Again, the way in which the Human Rights Commission was juggled with to suit the predilections of one member of the Council makes it clear that horse trading will continue to be the norm. And sadly the President does not seem to realize that abdicating his responsibilities even in their current truncated form is playing into the hands of those who want to turn him into a cipher. QFinally on a personal note what are you writing these days?Are you working on any new books? As you know, I finished 6 books during my retirement, 4 of which are now available at www.godage.com while the fifth, on foreign policy, is now being printed. But since I took over as Chairman of the Tertiary and Vocational Education Commission, I am back to producing textbooks, a grave need given that English and Soft Skills were neglected in this sector for the last few decades. The first book, ‘Building Career Skills’, is now out and will be followed shortly by ‘Developing Career Skills’ and ‘Advancing Career Skills’, and then there will be handbooks for different sectors.